Tomatoes are one of the most common plants to grow in a vegetable garden, but gardeners are often surprised and frustrated when their tomato plant foliage goes from green and full to dry and curled up in only a few days. One of the first signs of disease on a tomato plant is the presence of brown, and possibly yellowish, leaves. There are many reasons why leaves might turn brown and they are easy to diagnose. It is possible to stop the spread of brown leaves and save the tomato plant. Identification of disease on tomato plants includes brown or spotty leaves, but can also include fungal spots on stems or on the tomato fruit itself. When the problem is brown leaves, the spots are dark brown to black. The area around the spot usually begins to turn yellow and eventually the leaf will off the plant. Very often these spots appear late in the growing season after the tomato has produced most of its fruit. The most frequent cause for brown or spotty leaves on a tomato plant is a disease called blight. Early blight, or fungus Alternaria solani, starts on the lower leaflets and moves up the plant. Even though it is called early blight, it occurs most often late in the growing season. Early blight can spread to the tomato plant's stems and cause the plant’s fruit to drop before it is ripe. Early blight can also attack your eggplant and potato plants. Late blight, or Phytophthora infestans, occurs in places with very cool and moist night temperatures and warm days. If the temperature ranges between 50 and 55 degrees F, late blight can thrive. Heavy dew can also exacerbate the problem. Late blight is rare and the spots more closely resemble dark green or black at first and very quickly turn dark brown. The late blight fungus progresses fast, so it is important to get it under control as soon as it is noticed. The way to manage blight and the brown leaves it forms on your tomatoes is to take action quickly before the fungus can take hold. Remove the affected leaves as soon as you notice any spots forming. If that does not seem to help and the leaves continue to turn brown, use a fungicide and spray it directly onto the affected foliage. Use an environmentally safe fungicide to protect the health of the unharvested fruit of your tomato plant. Blight thrives in wet and moist conditions. A way to prevent the blight fungus from affecting your tomato crop is to cover the plants. Erect a plastic structure over the tomato plant that allows the light to shine in, but keeps the morning dew and the rain away from your plants. 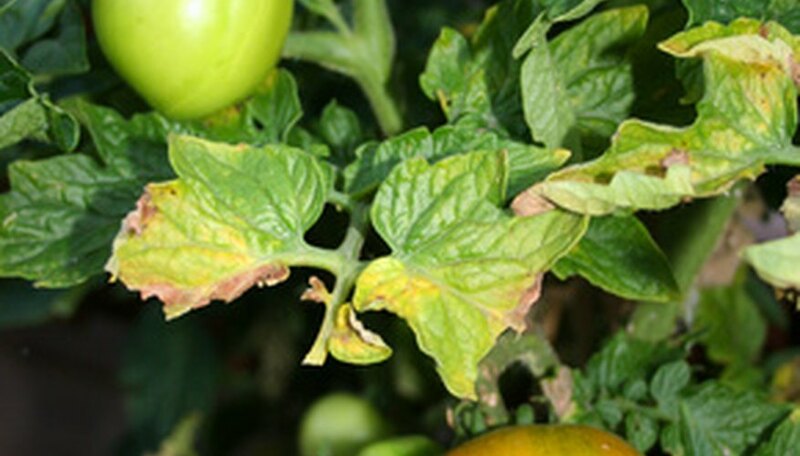 The blight fungus begins as a spore and by keeping the foliage of the tomato plant dry and covered, the spore's chances of landing and growing on the tomato foliage are greatly reduced. Rotate tomato crops by planting them in a different place every year. Only plant tomatoes in the same area of the garden once every four years. Destroy all tomato plants at the end of the season and don't plant new tomatoes in the same areas of other plants that suffer from blight, such as eggplant or potato.